Home / When do you use Real Bids and when do you use Voucher Bids? When do you use Real Bids and when do you use Voucher Bids? When do you use one as opposed to the other? Since Voucher Bids don’t factor into a Buy Now do you feel less confident bidding with them? What’s the easiest, most consistent, and/or best way you’ve found to acquire Voucher Bids? Do you even bid on auctions for Voucher Bids? How does the bid type affect your strategy for winning auctions? Let’s talk about these questions and more down in the comments! I’ll keep an eye on this blog post all afternoon to chat with you guys and hopefully clear up any issues or misunderstandings that may arise. But before you start posting, please make sure you’ve got your facts straight! I’ve included some basic and some more advanced facts about Real Bids and Voucher Bids on QuiBids. 1. In auctions, your opponents can’t determine the difference between a Real Bid and a Voucher Bid. However, they can tell if the bid was placed by a Bid-O-Matic or not. 3. Voucher Bids are most commonly won at auction and do not count toward a Buy Now purchase because they were not purchased directly. Typically they expire in a matter of days or weeks, depending on how they were acquired. You can see when each Voucher Bid in your account will expire by checking your Bid Credit History. Control which type of bids are used first by clicking on the Bid Credit History link in My QuiBids. By winning them in Voucher Bid auctions. Via a purchase from the QuiBids Store. Through our regular social media giveaways. By using the Refer a Friend feature. By playing QuiBids Games and earning Badges. 5. 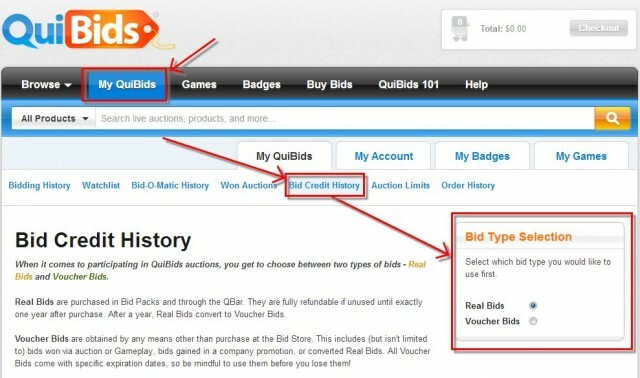 Bids acquired via the purchase of an item from the QuiBids Store are Voucher Bids and not Real Bids. So hop on in there in the comments below! I’ll get us started with a question down there. How Do I Start Bidding on QuiBids?